South Florida protest denounces U.S. war on Syria | Fight Back! 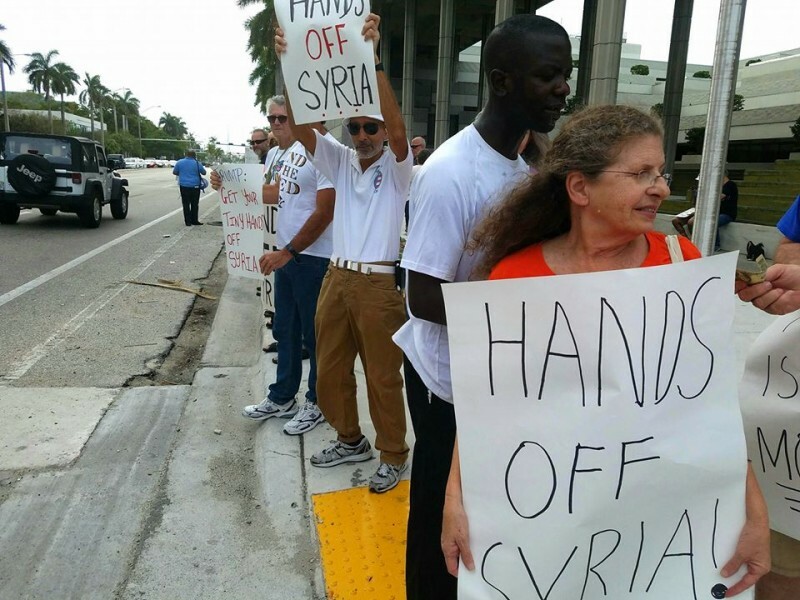 Fort Lauderdale, FL - On Sunday, April 15, about 25 members of the South Florida activist community joined together outside of the federal courthouse in Fort Lauderdale to protest the latest U.S. attacks on Syria. The event was in reaction to the attack Friday night by U.S. and its accomplices, in which they illegally bombed three government-controlled sites in and around heavily populated areas in Syria. After about one hour of chanting and sign-waving, the group formed a circle to hear the organizers of the event speak about why protesting these endless wars is imperative. Lifetime anti-war activist Ray del Papa, of Pax Christi, addressed the crowd by reminding them of the lies told by the media and the politicians in the months leading up to the Iraq War. He warned that the U.S. is playing a world-ending game against Russia in Syria, and that the stakes are high. To show the hypocrisy in American ‘humanitarian intervention,’ Munro mentioned the desperate humanitarian crisis in Yemen caused by Saudi Arabia, the slaughter of dozens of Palestinians in recent weeks by Israel, and the millions of Iraqis killed in the U.S. ‘War on Terror,’ all acts committed by or assisted by the U.S.